Proudly Introducing New Glarus' Very Own . . . The Männerchor New Glarus was established in 1928 to preserve traditional Swiss and German music. With members from New Glarus and several surrounding communities, the group's performances of uniquely traditional German men's choral music and Swiss-dialect music are heard at many of the area's major events. The Männerchor regularly perform at the Volksfest celebration, the Wilhelm Tell Festival, Monroe SwissFest, Swiss Church services, as well as other public performances. The group has performed in Daley Plaza in Chicago, the Tinker Swiss Cottage in Rockford, Illinois, the Green County and Illinois's Stephenson County Fairs and as guest artists with the Madison Männerchor, Milwaukee Liedertafel and Milwaukee Liederkranz. Questions or interested in booking the Männerchor for your event, please email George Albright. The Jodlerklub New Glarus was organized on October 19, 1928 by five native-born Swiss who felt the need for keeping up the Swiss tradition of yodeling, which was so much a part of their life in their homeland. The Jodlerklub entertained for the first time at the Swiss Independence Day celebration in 1929. Today, this popular group entertains in the New Glarus area for the festivals throughout the year. These include the Volksfest (celebrating Swiss Independence Day), the Wilhelm Tell Festival, the World Dairy Expo in Madison, the Swissfest in Monroe and Winterfest. The Jodlerklub is noted for its variety of entertainment, including Swiss yodel songs, alphorn blowing, Thalerschwingen, flag throwing and Swiss accordion playing. 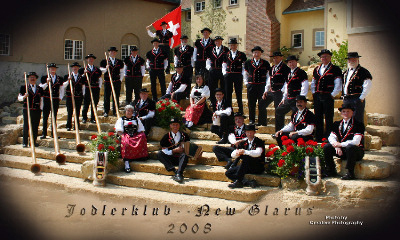 As a member of the Swiss Yodeling Association, the Jodlerklub New Glarus participated at the 2008 and 2011 JodelFests in Luzern and Interlaken, Switzerland. Questions or interested in booking the Jodlerklub for your event, please email John Colstad.